A spectacular event showcasing contemporary and traditional indigenous art has lit up Alice Springs this month. Parrtjima – a Festival in Light is the first authentic Indigenous light festival of its kind in the world. 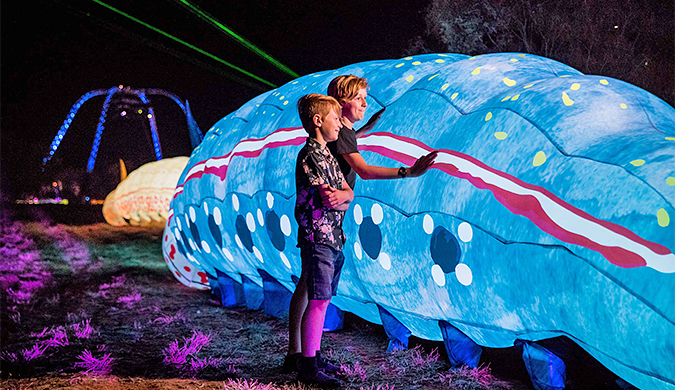 It features Australia’s biggest-ever light show installation, with more than 2.5 kilometres of the MacDonnell Ranges lit up as part of the event. The Northern Territory Government has worked with AGB Events, creators of the award-winning Vivid Sydney, in close collaboration with Indigenous artists. Parrtjima means ‘a point of light’ or ‘flash of light’ and takes its name from the Arrernte word ‘Parrtma’ meaning to ‘to throw light on’ in the context of explaining a topic in a similar way that we would shed light on a topic. The focus of the event is helping to share art, culture and stories from the Indigenous community. Parrtjima will take place at the Alice Springs Desert Park until 2 October.